On this year's beautiful, sunny "first Saturday in June", over seventy people showed up to for the annual project to pick up litter and plant Woodstock Boulevard cement garden boxes. Lots of families brought along their children to help. Organized by longtime community activist Angie Even under the umbrella of the Woodstock Stakeholders – with an annual grant from the Woodstock Community Business Association, under whom Angie had originated the project – this seventh annual cleanup contributes to the cleanliness of the boulevard and surrounding areas, and thus to the livability of the neighborhood. 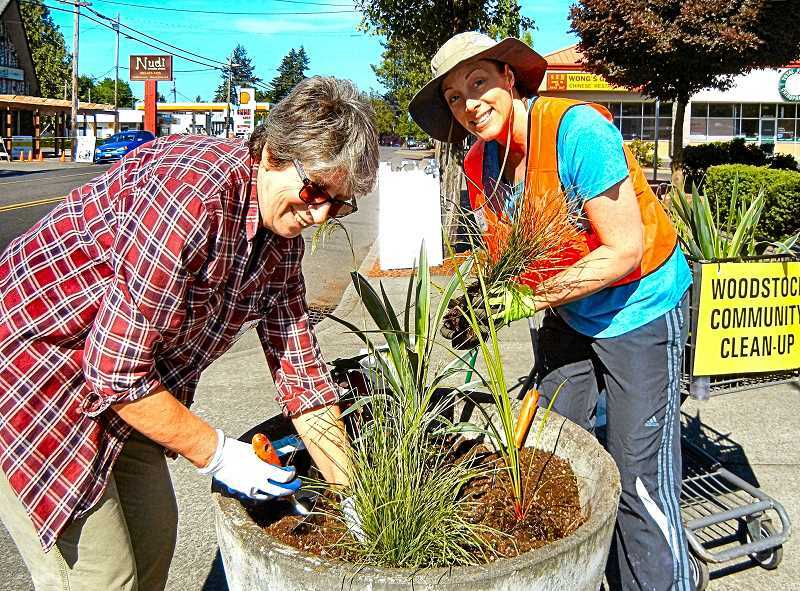 "I love planting, and the last few years [of this cleanup] I couldn't plant, because I was with my kids and we picked up litter," commented Beth Iversen – who, as she spoke with THE BEE, was working with Ingrid Mather to completely refresh a cement barrel planter south of BiMart. The container is far enough away from nearby businesses that it is not watered as often as necessary. "Usually some businesses take responsibility for their containers," remarked Gene Dieringer, owner of the BiMart and Safeway superblocks. "Since my brother Tim died, some of these have been neglected. Tim was very responsible about watering." As volunteers trickled in at noon after the cleanup, they began enjoying the promised lunch provided by local businesses. Pastries and fruit from Safeway and Grand Central Bakery, hot dogs from Otto's, chips and salads from Woodstock New Seasons Market, and pizza from Double Mountain Brewery, were on the free lunch menu. To facilitate the cleanup, grocery carts were lent by New Seasons. At the end of the day, forty-eight SOLVE bags, stuffed to the gills with litter, were brought in, and twelve planters were re-planted or renewed. One dumpster was filled with tree trimmings. In addition to the businesses who contributed edibles, the following made monetary donations: Advantis Credit Union, Cloud City Ice Cream, Delta Café, Hope City Church, John L. Scott Real Estate, On Point Credit Union, Portland Parks, Piccolina, Reed College, The Woodstock UPS Store, the WCBA, Woodstock Farmers Market, Woodstock Hardware, and the Woodstock Stakeholder Group. In addition, a $100 grant from SOLVE was utilized. Angie Even commented that the planter boxes on the boulevard help keep the neighborhood attractive, and businesses are urged to care for any that are in front of their establishment; and volunteers are still needed to make a commitment to water any of the garden pots that are not directly in front of businesses. If you're interested in helping out, save two empty gallon milk jug containers, fill them with water, and saturate soil in the planter or planters you've chosen once a week in dry spells. Don't let them become neglected! Choose a pot and "adopt" it, especially keeping an eye on it during summer months.